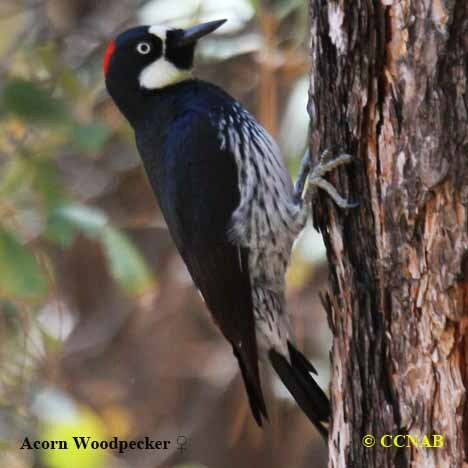 The Acorn Woodpecker (Melanerpes formicivorus) are seen in the southwestern areas of North America. 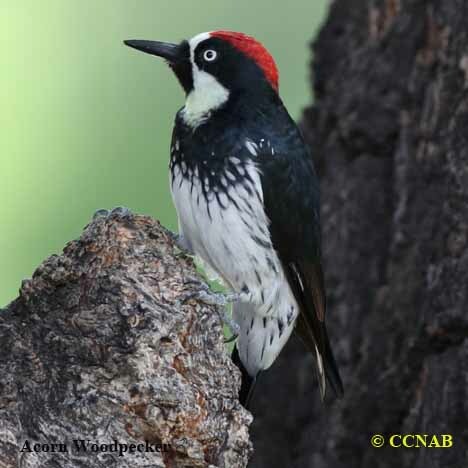 These birds are found in colonies, where there are multiple males and females. Adults assist one another in the rearing of the young. 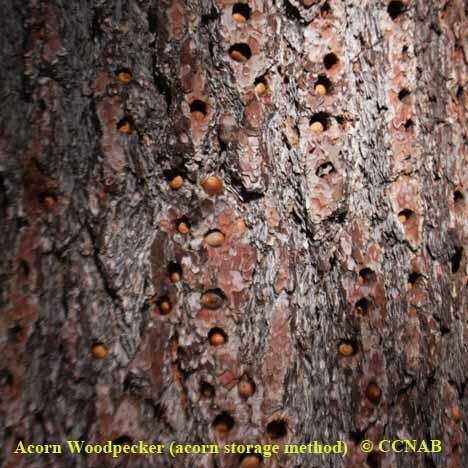 When the acorns are ready, the woodpeckers peck thousands into acorn-sized holes into the bark of trees. They store the acorns, by placing each mature acorn in a separate hole, hence creating a food supply for the winter months. They endeavour to protect the acorns from other animals and birds who also eat them. Distinctions: The male and female have mostly a black and white body. 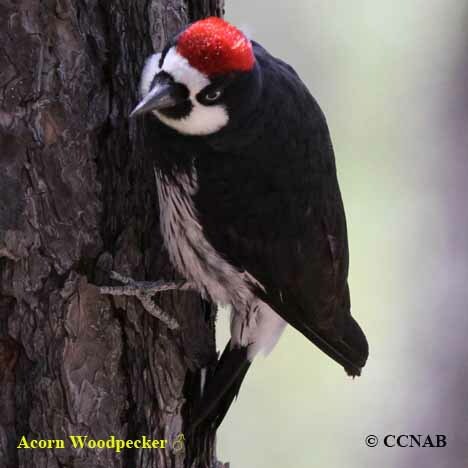 The male with a solid red crown, is distinguished from the female, who has only a red cap with a black forehead. Large white wing patches become visible when the birds are seen flying. Both sexes have white eyes with dark pupils. The juveniles also have a complete red crown but a duller plumage and dark eyes. Voice: Very loud and noisy, usually made by more than one bird. 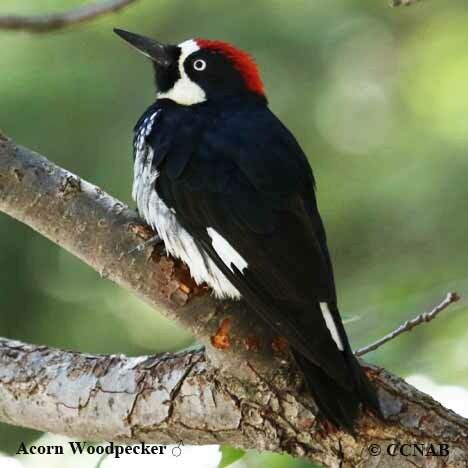 Like most woodpecker, they do communicate to one another, by drumming on dry twigs or hollow limbs of trees. Nesting: Four to five white eggs, one, maybe two broods per year. Nest is located in a cavity of a tree, in which both parents have pecked out. 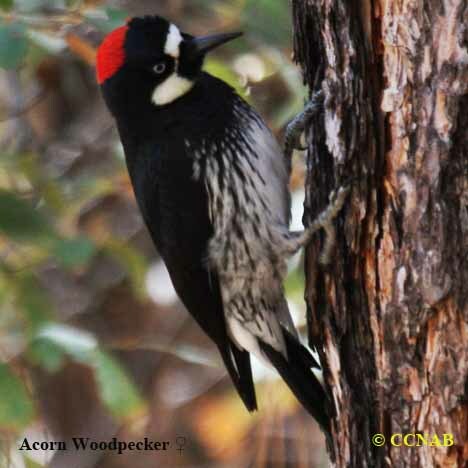 Distribution: Found in mixed oak forests or oak/coniferous forests. Seen mostly west of the Rocky Mountains, from the state of Washington, south to southern California and across the Sierra Mountains. Found also in Arizona, through to New Mexico and into western Texas. 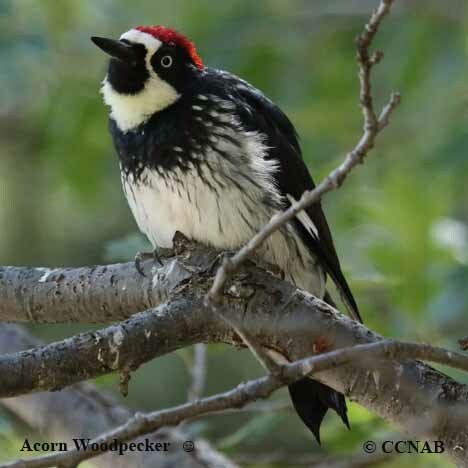 There are also a small populations of these woodpeckers in Nevada and Colorado.